The S&P 500, a key to growth of capital in broadly diversified portfolios for the long run, posted a 3.1% return in 2Q2017, following a 6.1% gain in 1Q2017. Total return on the S&P 500 since 1926 has averaged about 10%, making the 9.3% return in the first half of 2017 an exceptionally strong start to the year. 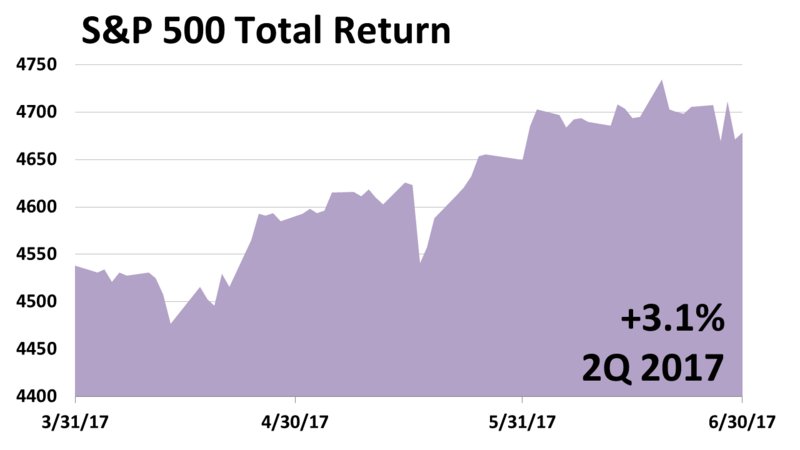 After trading sideways from mid-2015 to mid-2016, and suffering two one-day, double-digit plunges, stock prices broke out in the second half of 2016. 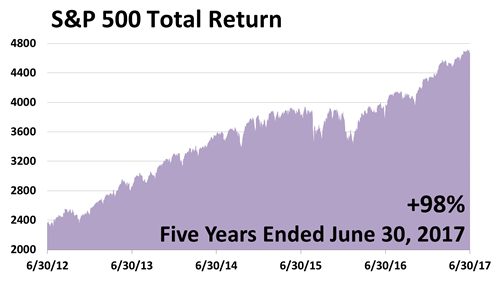 Over the last five years, including dividends, stocks nearly doubled in value. Chances of a bear market decline of 20% or more increases as the bull market grows older. 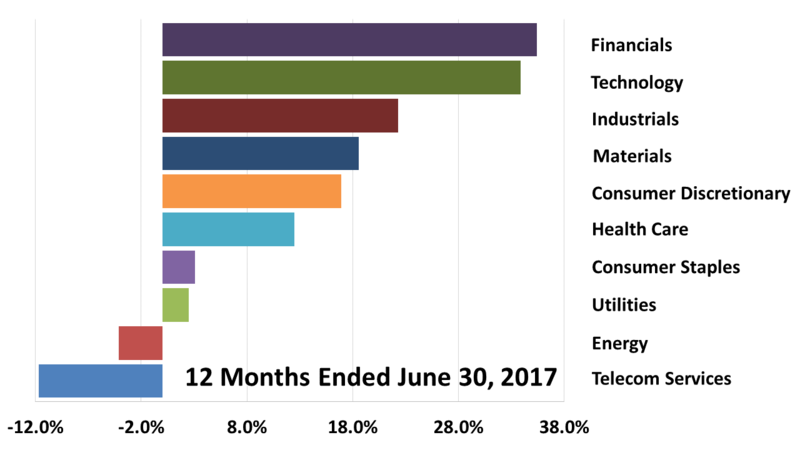 For the 12 months ended June 30, financial stocks topped all 10 sectors. With a rollback in rules implementing the Dodd-Frank Act of 2010 expected to boost Wall Street, financials soared, also aided by rising rates, which will boost bank profits. Tech also shot up. 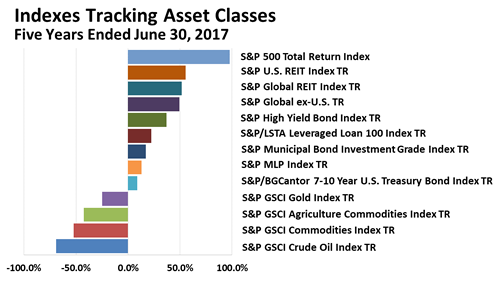 For the five years ended June 30, 2017, U.S. large-cap stocks were tops among the broad array of 13 asset classes. 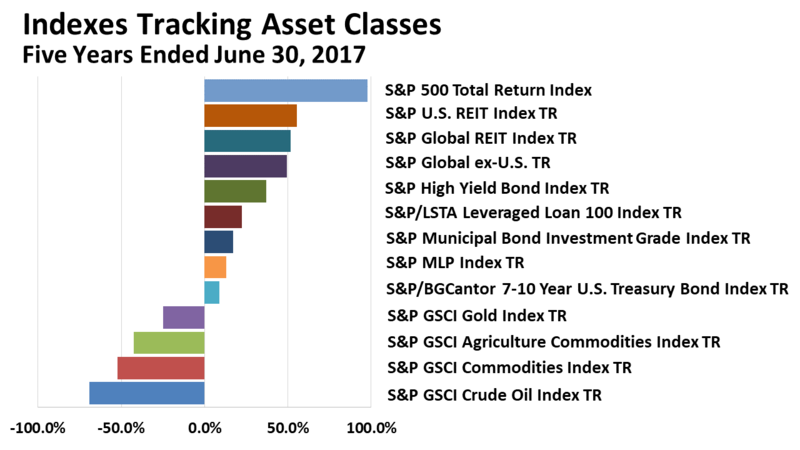 U.S. stocks have been the growth engine of diversified portfolios. What’s not shown here is that, in the past year, U.S. stocks trailed foreign indexed and the global economy is growing at a strong pace. At 96 months, this expansion and bull market are getting on in years, beating the 92-month expansion in the ‘80s. 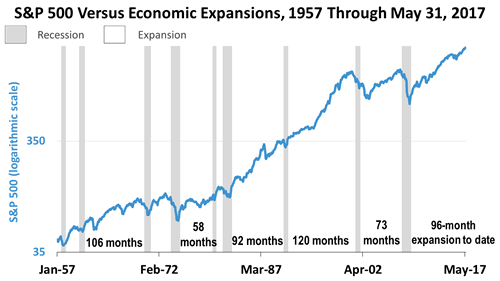 As the 106-month boom in the ‘60s approaches, the record-longest boom post-WW2 — the 120-month boom lasting the length of the ‘90s, could be exceeded by this expansion. 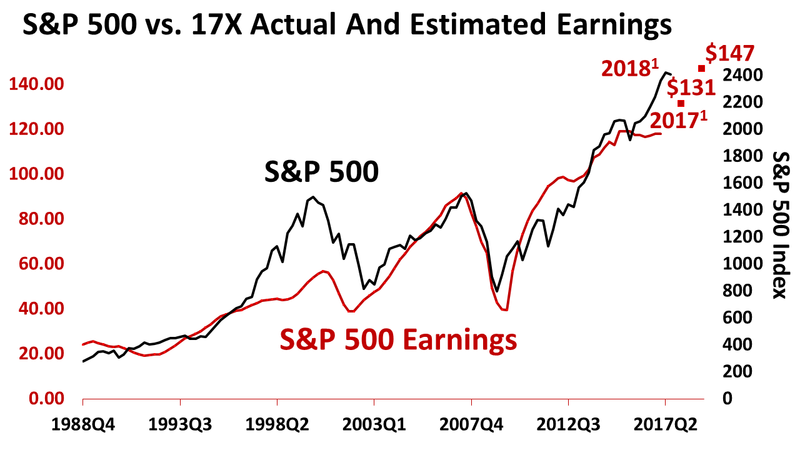 Estimated 2017 earnings on an average share of the S&P 500, as of July 9, was $131.47 and $147.10 for 2018. 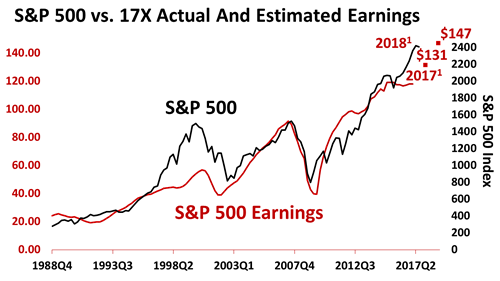 Stock prices have climbed with earnings. Though perhaps slightly rich, the S&P 500 was valued fairly in light of earnings expected through 2018, and nothing like the bubble of 2000. Past performance of investments is not a very reliable indicator of future performance. ± Indices and ETFs representing asset classes are unmanaged and not recommendations for any specific investment. Foreign investing involves currency and political risk and foreign-country instability. Bonds offer a fixed rate of return while stocks fluctuate. Leading economic indicators from the Conference Board. S&P 500 bottom-up operating earnings per share for 2016 (actual), 2017 (estimated) and 2018 (estimated) as of July 9, 2017: for 2017, $131.47; for 2018, $147.10. Sources: Yardeni Research, Inc. and Thomson Reuters I/B/E/S survey of consensus estimates. Standard and Poor’s for index price data through July 6, 2017; and actual operating earnings data through 2016.